I was shocked to hear the news yesterday. I am so sorry for your loss. But I am so thankful that you had this blog where we could keep up with Olivia. Every post brought a smile and I would think “she hasn’t changed”. Y’ all are in my thoughts and prayers everyday. I’ve enjoyed “getting to know” Wibby so much through this blog. I am so sorry for your loss. I will miss her too. There are no words. I am just totally in shock. And I am shedding tears of sadness for all of you right now as I read this. I am so very sorry for your loss, Margaret, Billy, and Lori. 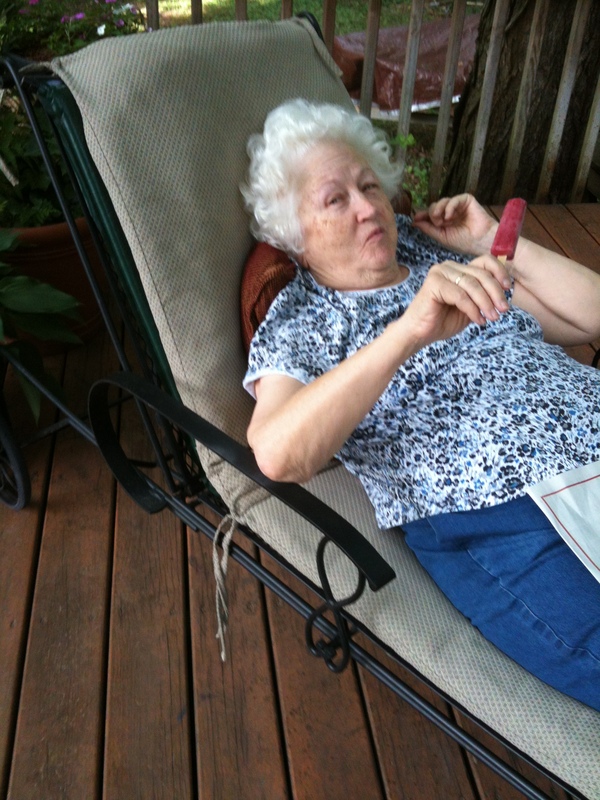 Your mama was a hoot, and was one in a trillion….The Good Lord above broke the mold when they made your mama. She was such a giving, loving person. I will always think of her fondly, and I will remember you all in my prayers as you grieve the loss of your beautiful mom. I know she must be dancing with your Daddy in Heaven right about now. I always looked forward to reading more Wibby stories, Margaret. I know she is so proud of all of you. May the angels surround you and comfort you all during this time. Again, I am so sorry. my thoughts are with your family tonight….i am so sorry. Our hearts are broken for Wibby and all the Renkls and Moxleys. Wibby at a distance, on your blog and in conversation, the picture on the blog home page, her aging recalcitrance and humor, awed me, made me laugh, made me tear up. I can’t imagine how devastating her sudden absence is and will be for you. Thank you for having shared her with us for far too short a time. Both you and Billy are unique and special people. I am sure your mother was very proud of both of you. I am sorry that I can’t be of any help as you deal with this physically, emotionally and spiritually, but please be assured that I am thinking of you and your children, your husband, your brother and his family. I have already prayed and will continue to pray that God’s hand will bring you comfort and show you constant reminders of His love for all of you and your mother. I know your heart is broken. I’m so sorry. I love you so much. Totally in shock, and sad. Thoughts for all of you. I am so sad for all of you, Margaret. I just loved the Wibby that I knew through her blog, as well as her outlook on life and the amazing children it produced. I am so sorry for all of you, but I’m so, so glad you got to spend this time with her. I am thinking of all of you in your sorrow. Love to you, my friend. I am so sorry for your loss..she was one of a kind and makes me proud to have grown up around such an amazing and original woman. Her stories are hysterical and I LOVE that you called her Wibby..some of my fond memories are from the Christmas in July celebrations..only something she could have come up with for sure! I will keep you all in my prayers. Thanks for sharing these wonderful blogs.. I know the pain of your (our) loss but you can’t really know how fortunate you, Billy and Lori are to have had both Wibby and Bill for so long. I, too,am lucky to have such a chronicler. Finally heard the news.What a shock and a loss to everybody! Too soon, and no chance to prepare makes it much harder. Condolences to you and the family. You were much appreciated by my mom and myself.